Cake by the bride and her sister! When my husband and I were planning our wedding, I told him I really wanted to make our wedding cake myself - to say he wasn't keen was an understatement. Even though I'd made my friend Ros' wedding cake last year and really enjoyed the experience, he was worried I would get too stressed and be taking on too much. So I was wondering what to best do when my sister told me she'd like to make the cake as her gift to us - which I wasn't expecting at all - but that she was a bit nervous at taking on such a big cake. 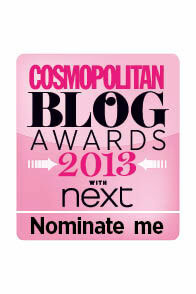 Which gave me the perfect opportunity to suggest we do it between us! 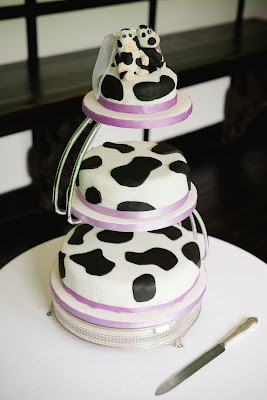 I knew from the start that the cake itself would be quite easy and quick to decorate as there was really only one design of cake we could have, as our last name is Cowe - pronounced cow - a cow print cake! It sounds silly but I think the cake overall looked really elegant, and as we only had a few other cow print touches (the whole wedding wasn't full-on cow print) it worked really well. My husband loves chocolate cake and also really likes fruit cake though I'm not as keen on fruit cake myself, so we decided to have each layer a different type of cake - fruit on the bottom, chocolate in the middle and lemon on the top. We decided that for ease of transportation and being able to prepare the fruit cake in advance, my sister Clare would do the top and bottom of the cake and I would do the middle. She'd just moved house and was renovating the new house so between an unfamiliar oven, and effectively a lot of building work going on, and a sister who kept asking whether she'd done the practice cake or not yet (to be fair she did leave it quite last-minute as she had so much else going on - unbeknown to me, she had also just discovered she was pregnant!) she did a brilliant job. Clare decided to buy the fruit cake from an online shop and cover it with marzipan and decorate it herself, and then bake the top layer the day before the wedding and decorate that too. I made a 9 inch chocolate cake for my middle layer using the same BBC Good Food recipe I'd done for Ros's cake as it worked so well, and once again the cake was beautifully moist and chocolatey. It came out of the oven perfectly, and I made a chocolate ganache buttercream which I spread round the sides and over the top, and then covered the cake with fondant. I baked the cake first thing on the Thursday morning (getting up at about 6.30am) and left it to cool while I went out to collect the wedding dress, and decorated it in the afternoon. We then travelled from Surrey to Wiltshire on the Friday and had a wedding rehearsal and left the cake, along with various other things, at the venue, and got married on the Saturday afternoon. The cake lasted really well and was still really good when we ate some of the leftovers on the Sunday! When I was thinking about the cow print decoration I knew I wanted the black patches to be different sizes and shapes but somehow still uniform - to not look like they had been cut out haphazardly and to have neat, sharp edges to make sure it looked professional. 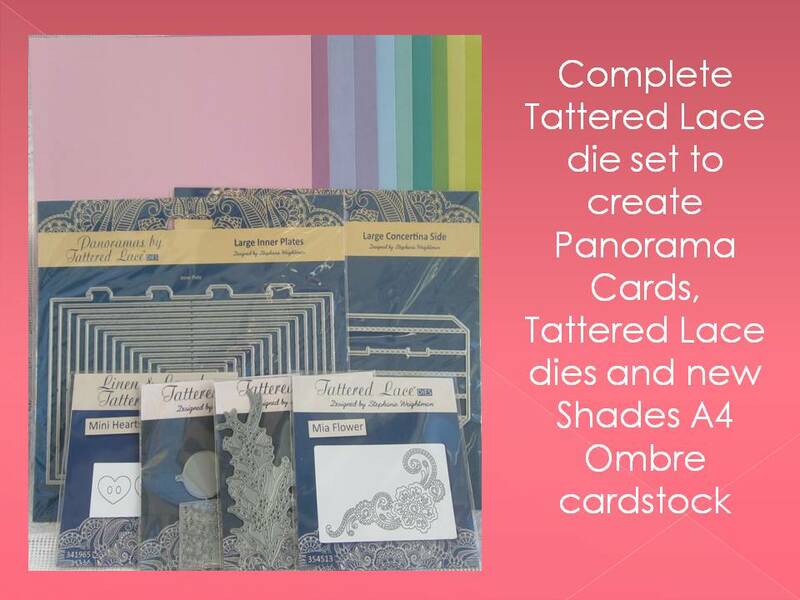 I came across a 'make your own cookie cutter kit' from Lakeland which was absolutely perfect. It was reduced at the time from £9.99 to £4.99 and is currently £2.99; I bought two so I could send one to my sister. It was really easy to bend the metal strips into different cow print shapes and secure the ends with the tape provided, and the cookie cutters worked perfectly on the black fondant (I used Renshaw). Each cake had a piece of ribbon around the bottom and another around the edge of the cake board in the exact same shade as our bridesmaid dresses; I got the ribbon from Fantastic Ribbons. 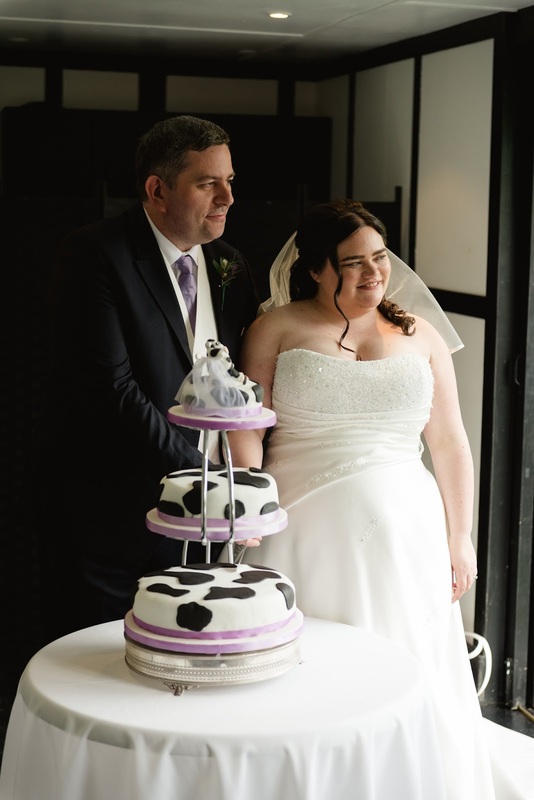 We also had to purchase cake boards, cardboard boxes to store and transport the cake, and I bought this cake stand from Windsor as I wanted one where each tier of the cake would be separated, so you could see the cow print on the top. We thought about having our names laser cut out of plastic as a cake topper - similar to the one Ros and James had, and we were going to order one over the internet until I decided I wanted something home made. 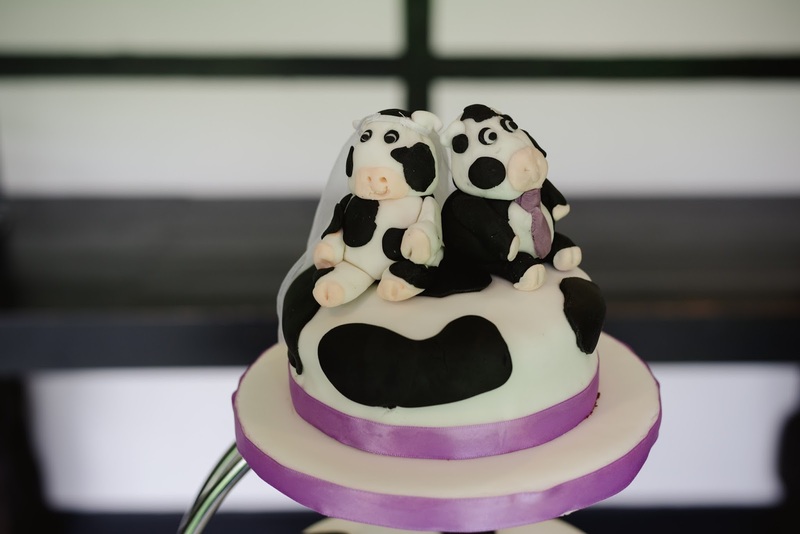 We investigated whether we could make our own using my Silhouette die cutter but realised it would only cut thick card and not any kind of thin plastic, so decided instead that we would have a more traditional bride and groom cake topper - but with an untraditional twist: two cows! I've made several animals from fondant before including a cow and a sheep so I knew I could easily make two cows to go on top. This link gives step-by-step instructions. I gave the groom a purple tie to match the wedding colours and bought a Barbie wedding dress and gave the veil from it to the bride! The cake was absolutely delicious, and we found that with a 12 inch bottom, 9 inch middle and 6 inch top cake we had plenty to feed 75 guests with some leftover, which we gave to the neighbours in our street. Here are some of the pictures our professional photographers, Lisa and Scott from Lisa Dawn Photography, took on our wedding day. I want to say a big thank you to my sister Clare again who has said "never again" when it comes to making a wedding cake, but I think she did a fantastic job and it meant a lot to me that my sister and I could make the cake together.